Feeling fatigued can be a sign of the flu, often preceding other, more identifiable symptoms. It can also linger after many other flu symptoms have disappeared. This is because of the amount of energy the immune system uses combatting the virus, meaning you may feel exhausted or lose strength in your muscles. 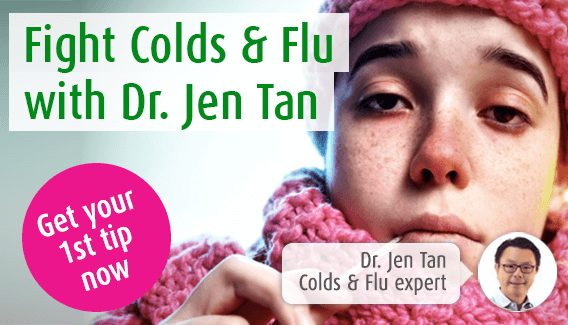 Our immune system expert, Dr. Jen Tan is on hand to talk about the causes of flu induced fatigue and to advise on home and herbal remedies. Fatigue is a feeling of tiredness which is either extreme, persistent or both. The flu can cause you to feel tired and drained, particularly when your joints are aching, your nose is streaming, and you have a headache. These symptoms often appear at the start of the flu episode and may precede other symptoms. In addition, fatigue can linger for weeks after all other symptoms have cleared. Why am I experiencing fatigue with the flu? Fatigue is common with the flu. This is not the usual tiredness after a night of poor sleep, or weakness muscle weakness associated with an unusually intense bout of exercise, but a feeling of complete exhaustion. It is common when suffering from the flu, and for the few weeks after other symptoms have eased. This is because your immune system has to employ much of its energy into fighting off the flu virus. White blood cells are diverted from their usual job of keeping your muscle fibres and joints repaired and healthy, to fighting off the virus, meaning that you quickly lose strength in your muscles, leaving you less able to stand and move. The best advice that can be given for fatigue, frustrating as it may seem, is to ensure you get plenty of rest. Remaining free of stress and anxiety, and accepting the fact that you may need a few days off work will see you back to full health more quickly than trying to carry on. You will need more rest than normal to help you to restore full health and energy. Although during the first few days of the flu you may not feel like eating anything, it is important to build up your strength again once the worst is over. Do not eat sugary or fatty foods, but foods such as wholegrain cereal and bread, low-fat yoghurt or hard-boiled eggs. It is also important to keep hydrated by drinking plenty of water or tea, as this will keep your muscles hydrated, reducing the effects of muscle weakness. Balance Mineral Drink can be extremely useful for those of you experiencing fatigue with the flu. It can help to boost energy and reduce fatigue, using a range of minerals including magnesium. It also replaces electrolytes you may have lost as a result of sweating, vomiting or eating poorly whilst suffering from the flu. As fatigue is a symptom of flu, it is also worth addressing the underlying problem by looking for a herbal remedy which will strengthen your immune system and help you to fight off infection. For example, the Echinacea plant is one of the most popular herbs for this function, and is also often used as a preventative measure against cold and flu viruses. Fresh extracts of the herb can be found in licensed herbal remedy Echinaforce® Echinacea tincture or tablets. Siberian Ginseng, also known as Eleutherococcus, is a herb native to Eastern Asia which has a traditional use in relieving fatigue. However, it should not be taken by diabetics, epileptics, schizophrenics or alongside certain types of medication. Are there conventional medicines to help with fatigue? A doctor will be unable to magically cure your symptoms of fatigue. Treatments such as antibiotics will have no effect on viral infections. There are some anti-viral drugs available on prescription. However, it is unlikely that a doctor will recommend these treatments unless your flu is severe. If you are particularly vulnerable to the flu, such as pregnant, elderly or a severe asthma sufferer, your doctor may suggest that you have the flu jab to prevent you getting the flu. However there are mild side-effects associated with the jab, including fatigue. This should subside quickly.